^ Sijpesteijn, Petra; Lennart Sundelin (2004). Papyrology and the History of Early Islamic Egypt. Leiden, Boston: Brill Academic Publishers. ISBN 978 90 04 13886 5. Gessman, A. M. (1976). 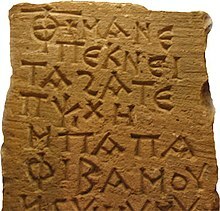 “The Birth of the Coptic Script”. University of South Florida Language Quarterly 14 2-3. Gignag, Francis Thomas. 1991. "Old Coptic". In The Coptic Encyclopedia, edited by Aziz Suryal Atiya. Vol. 8 of 8 vols. New York and Toronto: Macmillian Publishing Company and Collier Macmillian Canada. 169—188. Vergote, Jozef. 1973-1983. Grammaire copte. Leuven: Peeters.